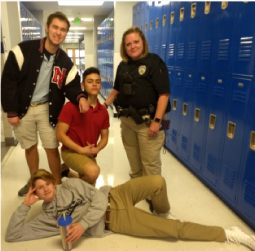 The North Carolina Leadership Academy (NCLA) now has a full-time SRO (school resource officer) on campus who not only provides a new level of security at the Kernersville charter school, but a safe and smiling face to students and staff alike. Kernersville Police Department (KPD) Officer Stacy Bottoms is a 20-year veteran of the KPD, having started her career with the local department in 1999. Over the years, Bottoms has worked in different law enforcement capacities, but one thing has remained the same: her love of people and desire to help. “I pursued law enforcement because I have a genuine love for people and I wanted to be in a position to help others and make a difference,” Bottoms said, taking a few minutes out of the day at The NCLA to talk about her time as an officer and being selected as the SRO for The NCLA. 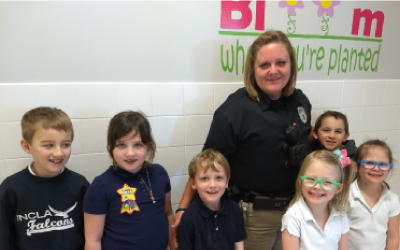 Although she has been on patrol for the majority of her career, Bottoms has served as an SRO before, at Southeast Middle School for two-and-a-half years starting in 2006. Afterward, she went back to the patrol division, where she has remained until now. Bottoms has also been on the KPD’s Crisis Negotiation Team since its development in 2007 and was promoted to coordinator of the seven-member team in 2016. Bottoms officially started her new position when students returned from their winter break on Thursday, Jan. 3, but had met with the academy’s staff the day before. “For me, being an SRO feels like a good position to make a lasting impact on the community,” Bottoms said. Bottoms believes SROs are able to provide an outreach to young people they might not have otherwise, closing the gap between them and law enforcement in a positive way. “It starts here,” Bottoms said, sharing that she’s already made one lasting connection in just a week. She has a second grader who gives Bottoms a hug every day. “I’m here to provide safety for the kids and safety for the staff, but I am also here to partner with kids in their journey through school,” Bottoms said. Bottoms is The NCLA’s first SRO. The academy went to the Town of Kernersville and Board of Aldermen a few months ago with a proposal for the KPD to provide an SRO to the school, with the academy providing the necessary funding. The Board finalized the request in December. The NCLA Principal Renee Faenza said the students have responded positively to having Bottoms on campus. The NCLA opened its High Point Road campus in 2014-15. Today, the academy has 830 students in grades kindergarten through 12th. Faenza said the academy has been considering providing an SRO for campus security for several years. “We wanted to wait until we could afford it,” she said. Bottoms has spent her first week on the job getting to know the students and staff. She’s even out in the car rider line when students are dropped off, opening doors and helping usher students inside. The KPD operates a seven-member SRO unit which provides officers to East Forsyth High, East Forsyth Middle, Kernersville Middle, Southeast Middle, Caleb’s Creek Elementary, Cash Elementary and Kernersville Elementary schools.